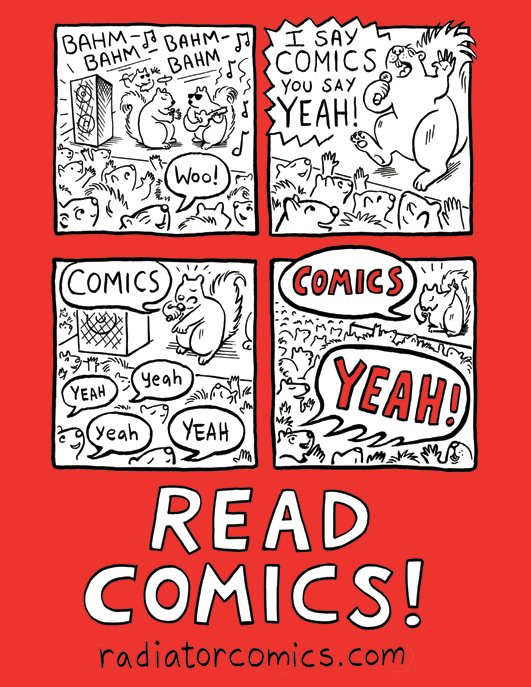 Radiator Comics distributes, produces, and promotes hand-made, self-published and small-press comics that focus on self-expression and storytelling. At the core of its mission is a commitment to increasing the population of comic book readers, providing support to comic book makers to create the best work they possibly can, and to fairly compensate those creators for their work. Founded in Chicago in July of 2014, Radiator Comics’ primary focus is distributing minicomics created by excellent comics makers who are passionate about telling sincere stories (both fictional and nonfictional) that speak to our society and humanity. Our secondary focus is publishing comics by up-and-coming comics makers who excite us. Radiator Comics is dedicated to encouraging and expanding a community of unique voices from diverse backgrounds, brought together by a passion for story, art, and self-publishing. In April of 2017, Radiator Comics published our first book, The Chronicles of Fortune, by Coco Picard. In August of 2017, we relocated to Miami. We are constantly looking for new artists to represent, and new venues to sell those artists’ comics to. We are also passionately invested in enriching the self-published and small-press comics community, and are interested in supporting others’ hard work for our community as well. If you want to get in touch with us about any of those concerns, please use this form to contact us. Radiator Comics is owned and operated by Neil Brideau, a maker of all-ages minicomics in Miami, FL. Neil worked at Quimby’s Bookstore (an epicenter of minicomics and zines) from 2009 – 2015. From 2010 to 2012, Neil was a founding co-organizer of the Chicago Zine Fest, and then helped found the Chicago Alternative Comics Expo in 2012, which he organized through 2017. Neil was a juror for the Ignatz Awards in 2017. He’s been making minicomics since 2006, and loves photocopying & binding his comics. “Read Comics” postcard art by Cara Bean! “Radiator Pack” banner art by Andrea Tsurumi! “Moving to Miami” banner art by Kenan Rubenstein! 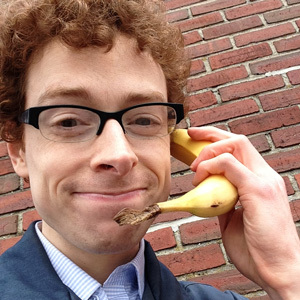 Photo of Neil pretending his banana is a phone was taken in Portland, ME, before MECAF 2014.